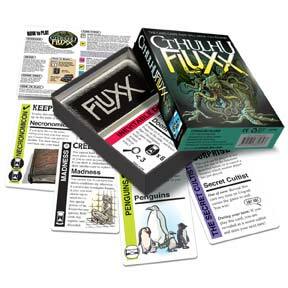 This version of Fluxx focuses specifically on the theme established by HP Lovecraft's Call of Cthulhu series. I’ll get this out of the way first – I am not much of a fan of Fluxx. My daughter (age 7) loves it. We bought Zombie Fluxx to see if it improved, but after repeated plays I actually prefer the original to Zombie. Our games of Zombie Fluxx never end up as fun/funny as we’d expect. At least not for my wife and I (especially the wife, she HATES Fluxx and won’t even play it anymore. I tolerate it, when the kid requests it. Well, my daughter notices Cthulhu Fluxx, and begs me for it. I am a sucker for Lovecraft/Cthulhu stuff, so after a bit of thought I decided to give it a try. Although it is still Fluxx, this seems to have enough tweaks to make it “work” better, imo. The ever-changing rules are still there ( go from “draw 1 play 1” to “draw 3 play all” to “draw 2 play 1” with all sorts of other “new rules”), but the theme of playing an investigator trying to collect “clues” in front of you (keepers, creepers, or both depending on the goal) makes the rules-insanity kind of fit. Also, the Cthulhu mythos creepers have doom amounts to them, and Ungoals can change the game to cause everyone to lose. This I found to be the greatest addition, as not only does it fit the theme, but it also has kept games from dragging on too long (One of my complaints with the original, is game times are all over the place). The one complaint I have, is that there are a LOT of Creepers, and not many cards to get rid of a lot of them. Again, though, it DOES kind of fit the theme. I purposefully played a card that caused the game to end due to the amount of Doom in play (no winner) just because I had a ton of creepers, and it was only a matter or time before my daughter would get a winning goal in play. We had a nice laugh about Cthulhu winning. Even though the general chaos of Fluxx is still there, this version I actually don’t mind playing so much. By no means is it one of my favorite games, but I actually don’t mind playing it. That makes my daughter AND myself very happy. First published 1996, Fluxx is both a card game and a state in which the card game exists. Published by Looney Labs, it is a game about matching conditional states which through the course of the game can flux and change. It is a chaotic game, one in which both the rules and the conditions to win can alter from one card play to the next. The play of Fluxx starts of simple. A player can Draw one card, Play one card. After that, cards can quickly alter the number of cards that a player can Draw, can Play, and even hold in his Hand. Each player’s aim is to get cards called Keepers down onto the table. If these Keepers match those on the Goal on the table, then the player wins. Of course, a player’s Keepers can change as easily as the Goal. Nothing is permanent in a Fluxx game, and that lack of permanency means that sometimes a player can win when it is not his turn because his Keepers meet the condition of the Goal. The state of the game is one of constant evolution, the current version of the base game being Fluxx 5.0, with there being another ten themed variants available, from Zombie Fluxx and Pirate Fluxx to Martian Fluxx and Monty Python Fluxx to the very latest variant, Cthulhu Fluxx. Designed by Keith Baker – who designed Atlas Games’ Origins Award winning Gloom and its variant Cthulhu Gloom – Cthulhu Fluxx brings the Mythos of the writings of H.P. Lovecraft to cosmic state of Fluxx and infuses it with a dark chaos. In doing so, it brings the Creeper mechanic – first seen in Zombie Fluxx – to bear as never before and adds new mechanics to the game that simulate the madness and chaos that ensues when the forces of the Mythos grow stronger and threaten the insanities of those that attempt to thwart it. The effect of the Creepers and the new mechanics is that it is entirely possible for there not to be a winner. Purely in keeping with the writings of H.P. Lovecraft, the “forces” of the Mythos can triumph over mankind and doom us all to our inevitable fate… Perhaps though, the human spirit will prevail and stave off these revelations as to the true nature of the universe. Much of the game’s flavour and theme shows in the choice of Keepers that the players are trying to match with the Goals and thus win Cthulhu Fluxx. The designer draws on innumerable Lovecraft tales as inspiration for the game’s cards. For example, Keepers include “The Dreamlands,” “The Poet,” “The Necronomicon,” “The Cat,” “Innsmouth,” and “The Reanimator” and more. Some Keepers have special abilities, like “The Reanimator” being able to steal “The Body” Creeper if it is in play. The Goals include “Pickman’s Model” which requires the “Ghoul” and “Artist” Keepers to win; “Herbert West: Reanimator!” will want “The Body” and “The Reanimator” to win; and “Penguin Therapy” needs the “Sanitorium” and “Penguins” Keepers to win. Already the inspirations for cards – Pickman’s Model, Herbert West: Reanimator! , and At the Mountains of Madness – should be obvious to most devote and part of the pleasure in playing the game lies in identifying the inspiration and to a certain extent playing along to the narrative of the particular inspiration. What stands in the way of both Keepers and Goals for each player is not just his rivals, but two other types of cards – the Creeper and the Ungoal. First seen in Zombie Fluxx, Creepers come out of a player’s hand as soon as he draws them to sit on the table and prevent him from winning. In Cthulhu Fluxx, Creepers are can be as much Mythos entities such as Cthulhu and Yog-Sothoth as they can states like Madness and Metamorphosis. Whilst Creepers prevent you from winning, the Creepers that represent a state, actually inflict that state on a Keeper by attaching themselves to it and negating any special ability that the Keeper might have. So for example, “Nightmares” attaches itself to a Keeper that has an Investigator Icon on it like “The Reanimator,” negating its ability to steal “The Body” Creeper if it is in play. Creepers remain on the table until they can be got rid of, which is not easy. When a Creeper is attached to a Keeper, both cards stay together until both are discarded. Despite this, Creepers are not wholly negative. Some Goals have to be met by playing Creepers and Keepers. For example, the “Herbert West: Reanimator!” Goal requires the “The Reanimator” Keeper and “The Body” Creeper to be all in play to win for that Goal. Ungoals represent the forces of the Mythos – or in this case, Cthulhu Fluxx – beating the players and winning the game. For example, under the terms of “The Call of Cthulhu” Ungoal, Cthulhu Fluxx wins if there are six or more Doom Icons in play and the “Cthulhu” Creeper card is also in play. This of course is bad. It is of course, doubly bad because the “Cthulhu” Creeper card actually adds three Doom Icons all by itself! Cthulhu Fluxx also has two other types of card. Surprise cards can be played when it is not a player’s turn or when it is. For example, the “Secret Cultist” can win the game for a player or it can hinder him. When played during his turn, it reveals the player as a secret cultist and forces him to lose his next turn. If played when the conditions of an Ungoal are met and the game is ended and lost by the players, then it reveals the player as a secret cultist, who as a devotee of the Old Ones actually wins the game rather than Cthulhu Fluxx itself. The last card type is the Meta Rule, which is only added with everyone’s consent. There is only one included in Cthulhu Fluxx, “Cult Clash,” which adds a final winning condition if an Ungoal loses everyone the game. The player with the most Doom Icons actually wins, unless another player can play the “Secret Cultist” Surprise card and trump everyone in the “Who is the Most Evil” stakes. Like other Fluxx titles, Cthulhu Fluxx is all about meeting a certain condition if a player is to win. Of course, this is never easy, because not only can the conditions change from one turn to the next – and even within a turn, but so can the means of meeting them. As has been hinted at, Cthulhu Fluxx increases the array of conditions beyond the matching of Keeper and Creeper cards with a Goal card by adding Icons. These are the magnifying glass shaped Investigator Icons, the hour-glass shaped Doom Icons, and the hour-glass on its side, Anti-Doom Icons. Investigator Icons are found certain Keeper cards; Doom Icons on Creeper cards and Keeper cards; and Anti-Doom Icons on Keeper cards. Of course Doom and Anti-Doom Icons cancel each other out when determining the total number of Doom Icons are in play for purposes of meeting the conditions of an Ungoal. The need to play both Keepers and Creepers in order to meet a Goal card’s conditions has a further negative effect in that both can add Doom Icons to the game and increase the Doom count towards any possible Ungoal. For example, “The Shadow Over Innsmouth” requires the “Innsmouth” Keeper and either the “Federal Agents” Keeper or the “Metamorphosis” Creeper to win. Yet both the “Innsmouth” Keeper and the “Metamorphosis” Creeper cards add Doom Icons to the count. Mechanically, the play of Cthulhu Fluxx is simple. Every player receives three cards and when it is his turn he follows the Basic Rule card of drawing one card, playing one card. If he has any Creeper cards at any time, these must be played on the table, invariably increasing the Doom count. If a player draws and plays a Creeper card, he gets to draw a card again to his hand replacing the Creeper just played. New Rule cards will change the number of cards that can be drawn, played, or held, while Action cards give him extra things that a player can do immediately. Action, Keeper, Goal, and Ungoal cards are played in the hope that in doing so a player will get nearer to winning, although often, the current rules on the New Rule cards in play will force a player to play them despite the fact that he might want to save them for a later turn. Or they might force him to discard them. Fluxx is all about change and adapting to that change. Cthulhu Fluxx is all about change and chaos and adapting to that change and chaos. Yet as player moves cards in and out of his hand, he needs to read those cards, more so than most Fluxx games. The number of possible conditions that can win a game in Cthulhu Fluxx is greater than normal Fluxx because of the need to track the Doom and Anti-Doom Icons, making this a more conditionally complex game. Compared to standard Fluxx, this is a much more complex game. Physically, as with all of the Fluxx games, Cthulhu Fluxx is well produced, the art is good – in fact it is better than many other Fluxx titles as their art can be cartoon-like – and the rules are solidly explained. Additionally the cards feel good in the hand and do stand up to being handled. Standard Fluxx, is well, Fluxx. It is a game about change and to an extent, chaos. Unlike many of the other variants, Cthulhu Fluxx succeeds in exacerbating that chaos in a pleasingly fitting fashion. It brings a complexity and a theme that fits the game mechanics, and in doing so, brings it a depth and a seriousness – all relative, granted – that other Fluxx games lack. More demanding, more complex, more chaotic, more Cthulhu, Cthulhu Fluxx is not your fluffy Fluxx of old. Okay, let’s fFirst address the elephant in the room: Another Fluxx game!? Yeah, it is another Fluxx game. But this one has a fFew things others before did not. Notably, Cthulhu. But I don’t really care fFor most of the Cthulhu games presently available, so who cares. The sense of Imminent Doom is pretty strong, here. That’s a pretty good new thing. I think that sense comes fFrom the fFact that you expect Fluxx to be casual and happy, but there are so many ungoals, and so many bad things waiting in the deck to jump out at us!! Sometimes it starts to fFeel like a cooperative game, as we try to keep everyone fFrom losing. Compared to other versions of Fluxx, this is not too much going on, and not too little going on. Monty Python Fluxx is a great game, but it can be distilled to a near fFormula of bland icons. Star Fluxx is wonderful, but seems like it has too many crazy artifacts doing outrageous things. Cthulhu Fluxx does have a number of icons which have to understood, but they fFeel less like conditions to met, and more like tokens to be counted. And, it has it’s share of artifacts, but I think they usually act with immediate effects (or not at all). The emphasis is put back on collecting keepers to meet goals, with crazy rules piling up. I think there is more strategy in this game, than in any Fluxx before it. Turns seem to last longer, and you usually want to hold on to more specific cards to meet specific goals. To be sure, this game is not fFor everyone. Mom and dad will probably want to stick with the standard Fluxx, and the strengths of Zombie Fluxx are still very good. But Cthulhu Fluxx is a winner, and probably my new fFavorite. 1. This one’s easy to guess. Of course it’s the (Flux-cartoonish) atmosphere of insanity created by the easily recognized characters from the macabre worlds of H. P. Lovecraft. This thumb up doesn’t only go to the famous figures (whose names are even mentioned on the cards,) all of the arts are great in general. 2. This one comes after a few rounds of gameplay. Cthulhu Fluxx is kind of insanely hard to win. Well, “insanely” just fits in the context, the game itself is not that hard in general. Yet, compared to those of the series I’ve tried (original Fluxx, Pirate, Zombie, Martian, Monty Python) this one quite often gets you in the stressy situation when all players have high chances to lose. But isn’t that what all Lovecraft stories and games based on those were about? Using the leftovers of your sanity to stay alive? Ive only played Star Fluxx, Monster Fluxx, and Cthulhu Fluxx but Cthulhu Fluxx is one of my favorites becuase of how many Creepers there are in the deck. A player cant win with a creeper in their area and in with this game I have sometimes seen every player have multiple creepers. Other games have been finished quickly before too many creepers came out but most games took a bit longer than the other fluxx games I have played due to the amount of creepers. That is if we didnt lose to the elder gods due to the new “ungoal” cards which make all players lose if they are fulfilled, unless of course you happen to be the secret cultist. WHATS NEW/DIFFERENT? 1. Ungoal cards which can make all players lose to the elder gods. 2. An optional second rule card to help determine a winner if an ungoal card is satisfied. 3. Lots of Creepers to annoy you and your friends. I love fluxx, so do my friends, we play it nearly every game night we have! But I made the mistake of buying this as my first steps in to the looney lab and found my self over powered by its complexity of investigators, doom count and other lovecraftian borisness. This nearly ruined the entire franchise for me and my friends it took a lot of convincing that the other versions were much better. Don’t get me wrong I love choas and randomness in games and fluxx excels at it but Cthulhu fluxx? Not for me, so much infact I gave it away to a friend who didn’t have a game of fluxx but a strong love for Cthulhu with the stern warning of how much I didn’t like it and the next day I went out and bought pirate fluxx and had much more fun. Get the game if you like make other people go insane and getting bragging rights to a simple 15-minute game that won’t help you with anything later in life. If you want a simple, easy to learn yet thrillingly fun game then get this one. The outcome is different every time, and the spice of Cthulhu really changes everything up. This is my second favorite Fluxx game, next to Monty Python Fluxx. THAT is an amazing game! 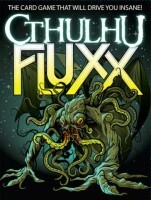 Add a Review for "Cthulhu Fluxx"